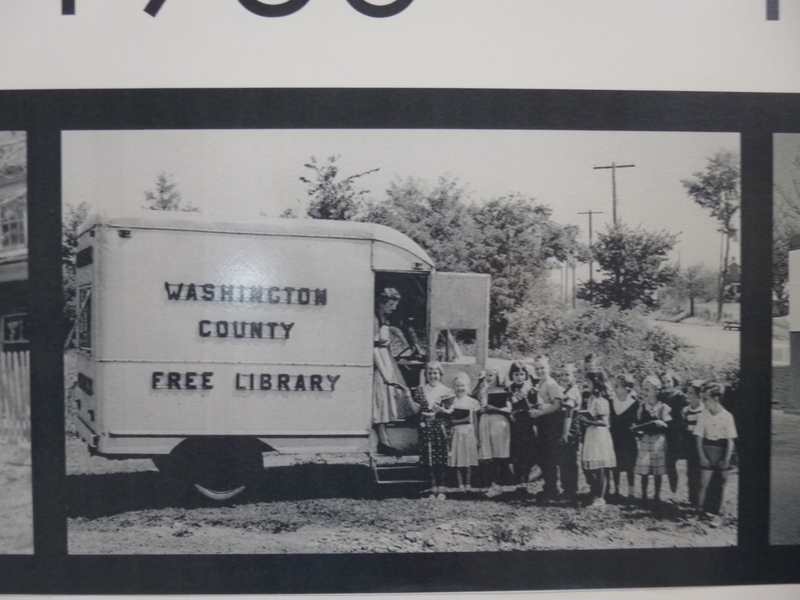 I had done some reading, and found out that the Washington County Library in Hagerstown, Maryland was home of the oldest bookmobile in the country. 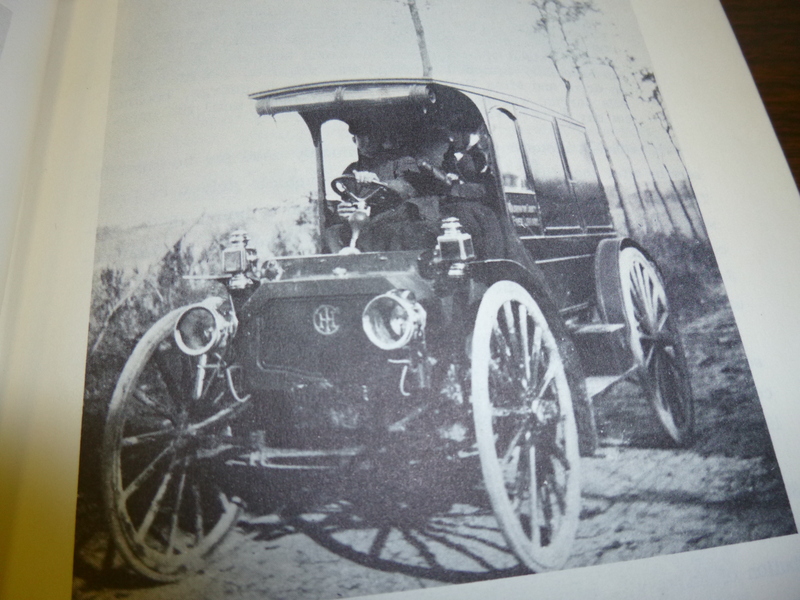 At the turn of the last century, reading was still considered a luxury by many people. 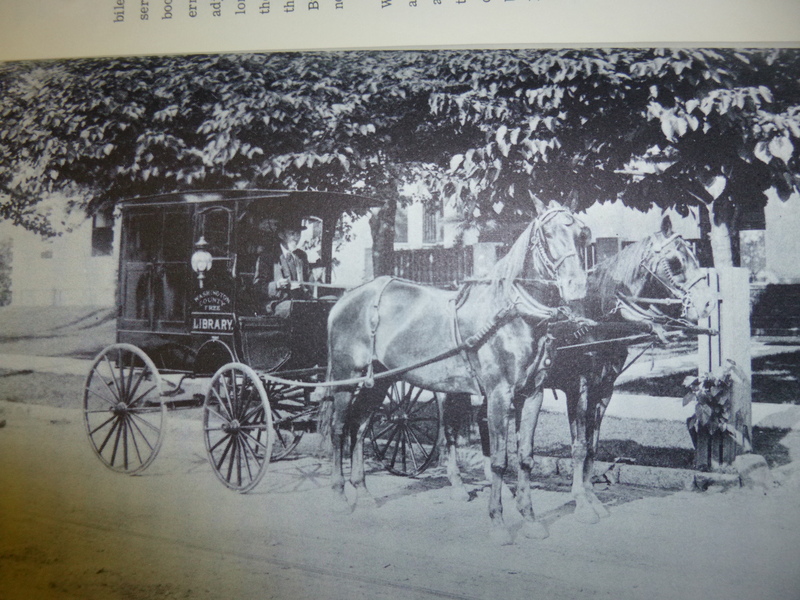 But in 1905 in Hagerstown, the librarian came up with the concept of a horse-drawn book wagon and loaded it up with a couple hundred books and sent the library janitor out to the rural farm areas. It was a big hit! 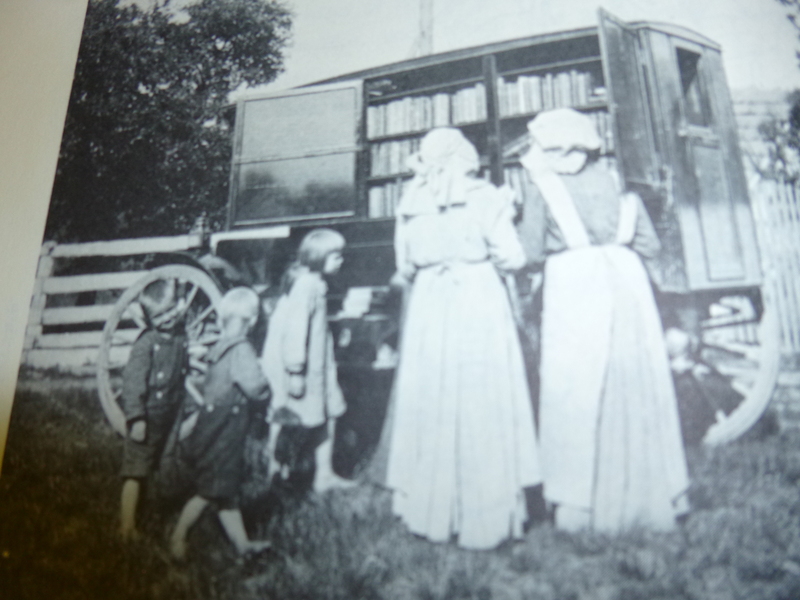 And the library’s bookmobile has been in service ever since except for a short time during one of the wars. 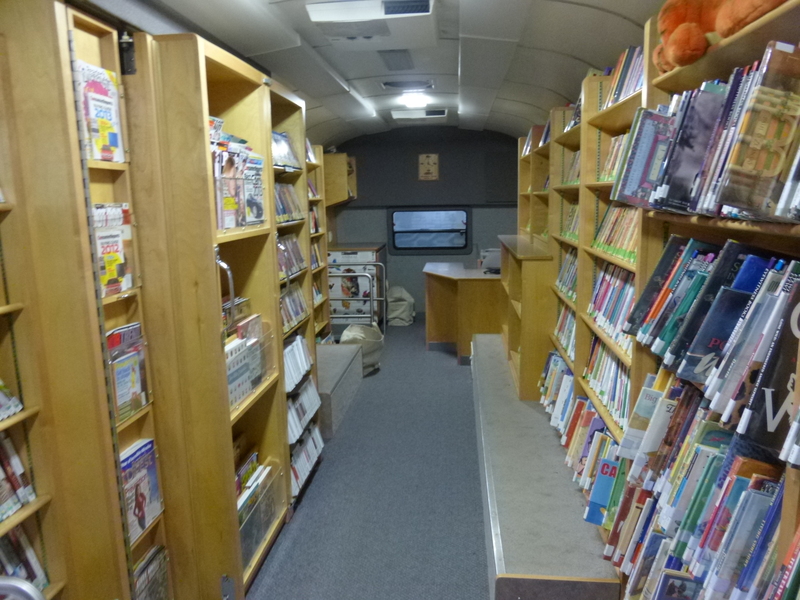 So I thought a donation to the oldest bookmobile in the country, so they can get some more books, would be a fun idea. 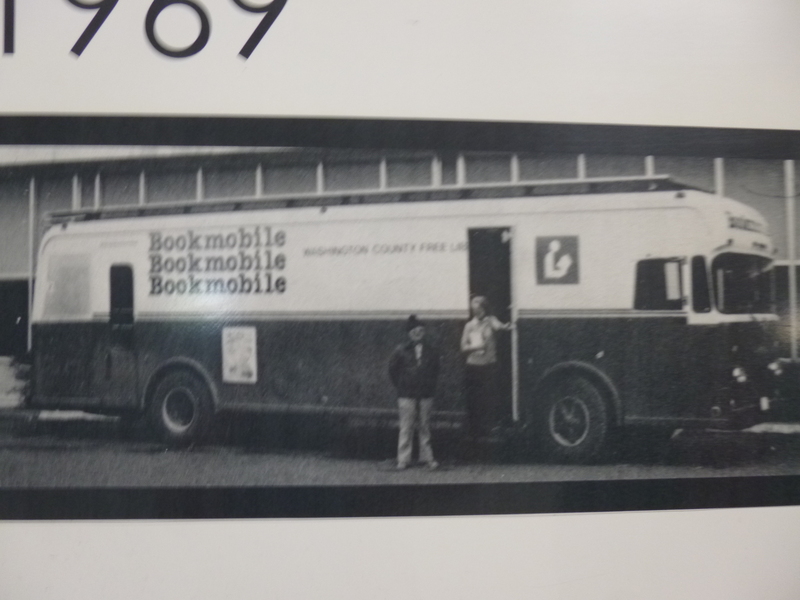 And this donation is in honor of my mom, who always has books close at hand – and she’s also enjoyed the services of a bookmobile. 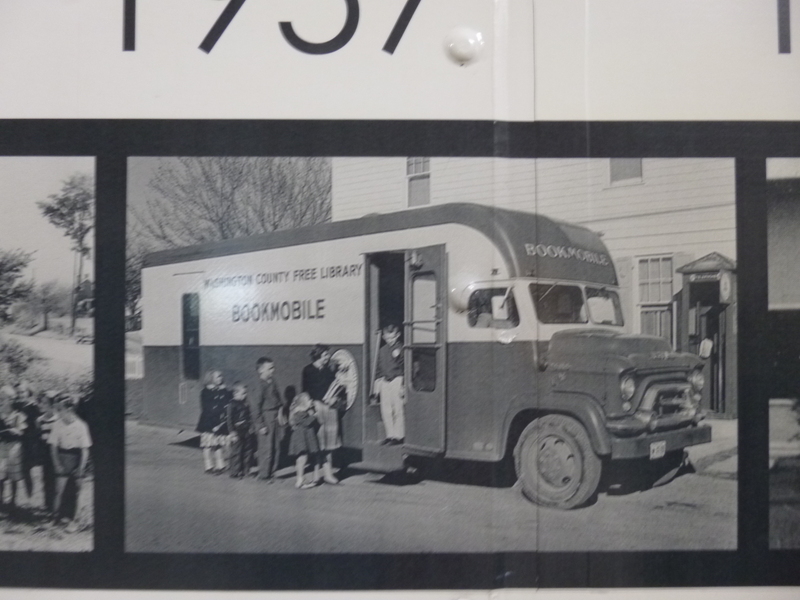 So I drove to the library in Hagerstown, hoping I’d be able to see a picture of the original book wagon. 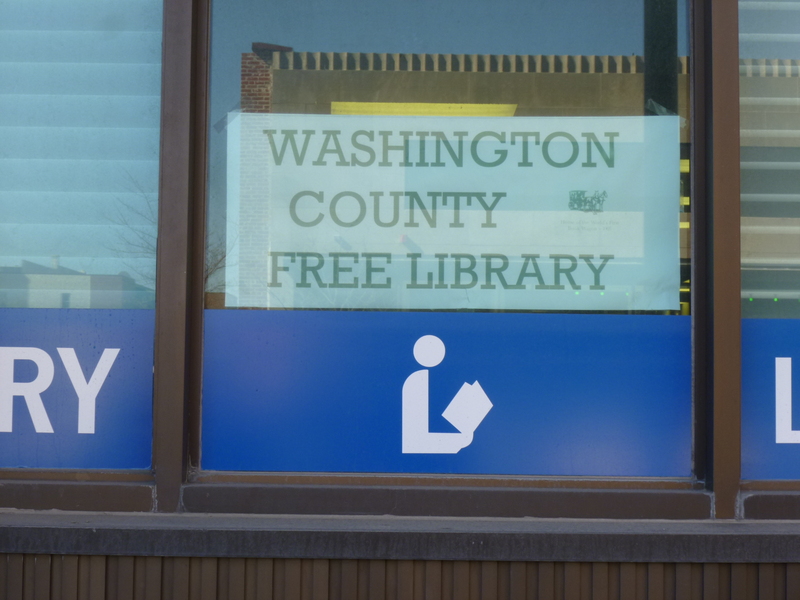 And I talked with Michelle at the library, and she was happy to help me with my quest to find a picture of it. 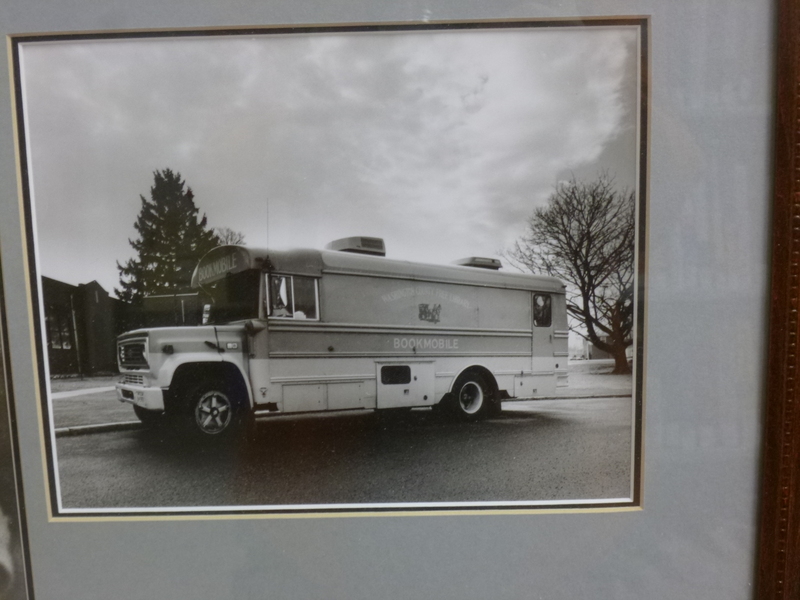 I learned more about the bookmobile and library, and she found some good pictures. Then she offered to call the place where the current bookmobile is (their library is undergoing renovations which will be complete soon, so the library has things in 2 different locations), and the lady there said she’d be happy to show me the warehouse that more of library books and current bookmobile are in. 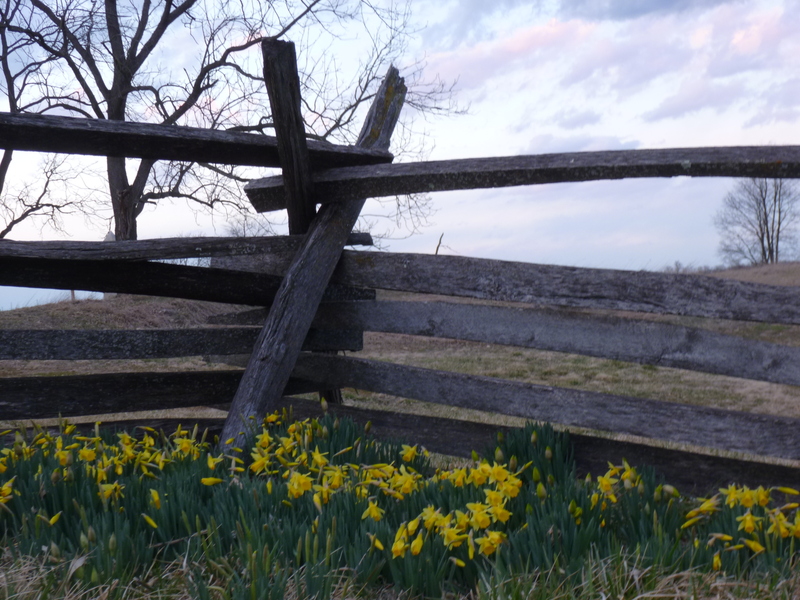 So I drove over there and met Marilyn and we talked for quite a while. 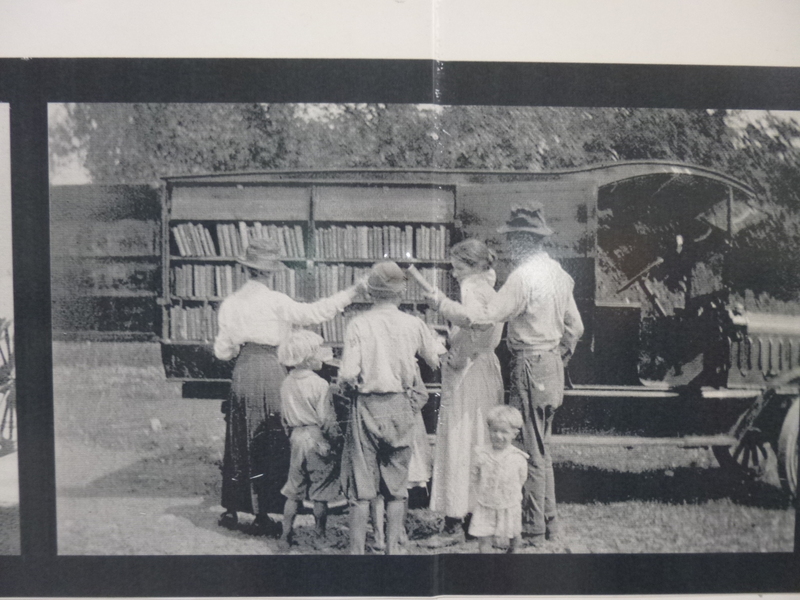 Their current bookmobile is like a huge RV, and the side of it is painted with a little history of the bookmobile, with pictures of all the different modes of transportation they’ve used in the past 100 years. 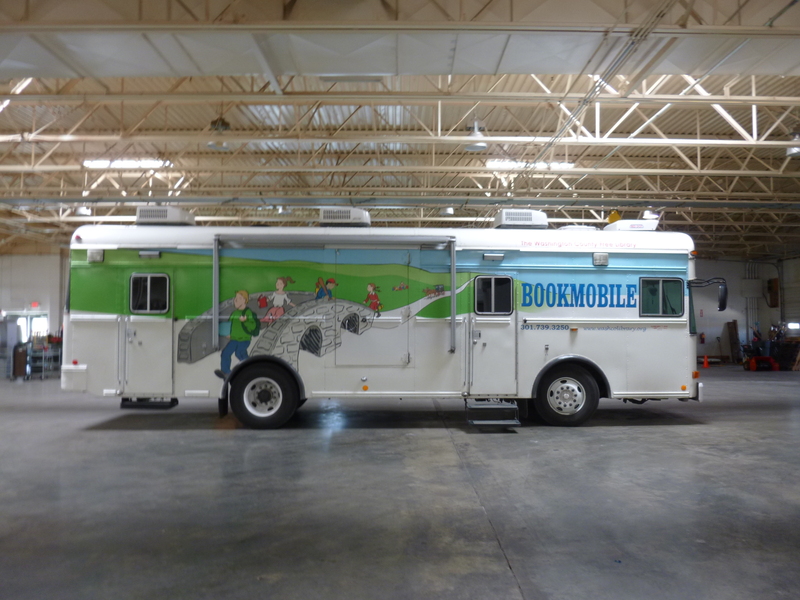 The bookmobile visits about 80 different places every month, and they no doubt make a lot of people very happy! It was a fun donation. 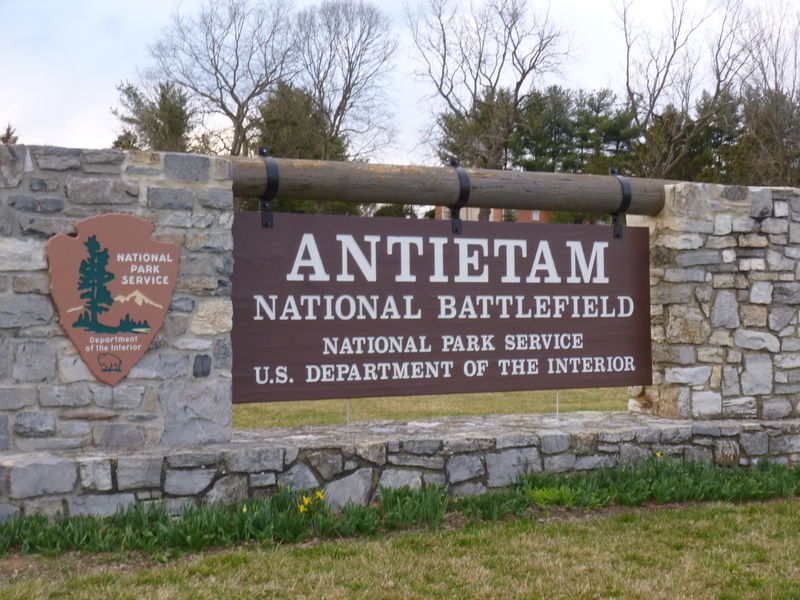 At that point, I was going to head to the Antietam National Battleground to do some walking and then I was going to head for the town of Frederick for my second donation. 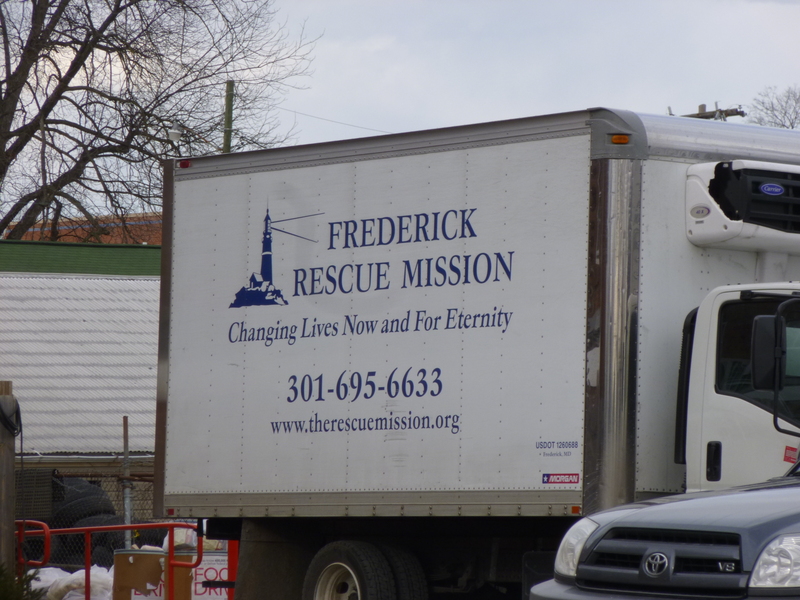 But knowing that the donations can sometimes take longer than I expect, I decided to head to Frederick first. This donation was also a fun one that I read about. 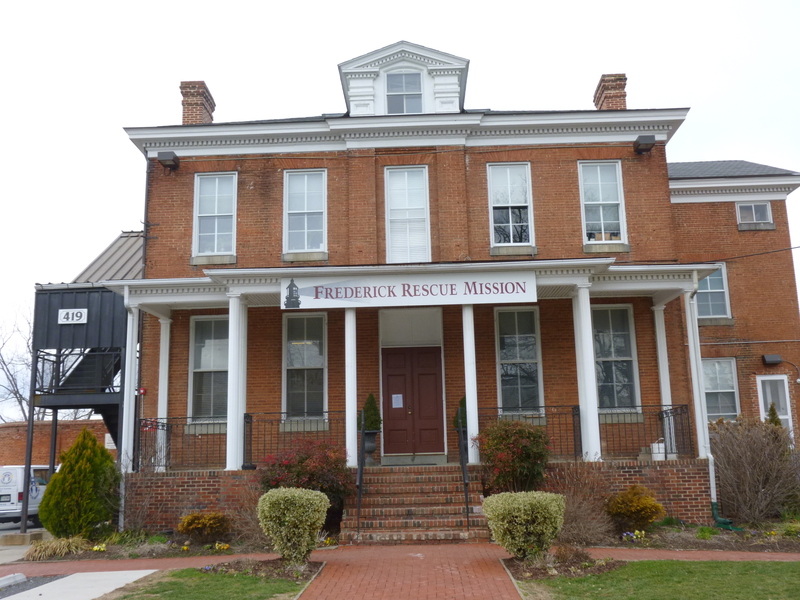 There’s a “Souper Sunday” fundraiser coming up for the Frederick Rescue Mission’s Hunger Relief Program, and I wanted to support that. 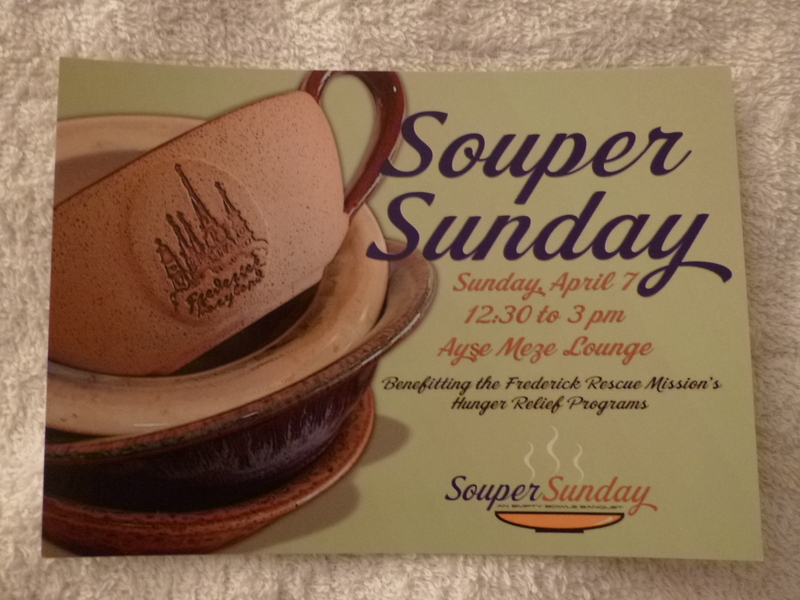 To do so, I went to a pottery shop in Frederick, where volunteers had made dozens of beautiful soup bowls to give away. By choosing a bowl, supporters were agreeing to pay $25 for a ticket to the fundraiser, where local chefs will be preparing lots of different kinds of soup to fill up the bowls. 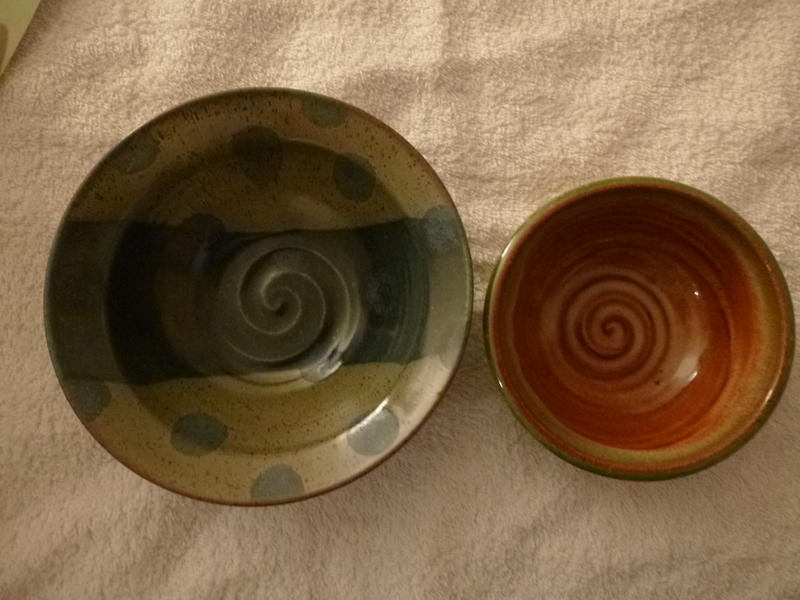 I won’t be in Maryland when the fundraiser is held, but I bought 2 tickets anyway – and gave them a little extra so it was $56 – and they let me choose 2 bowls. That took a while because there were lots of shapes, designs and colors! The event is very well attended, and last year they raised about $10,000. It would have been fun to be in town to sample a lot of good soup! Both Timber, the young lady running the shop, and another lady who was choosing out a bowl, were very supportive of my journey, and Timber even wrote a nice note and put it in my bag which I found later. 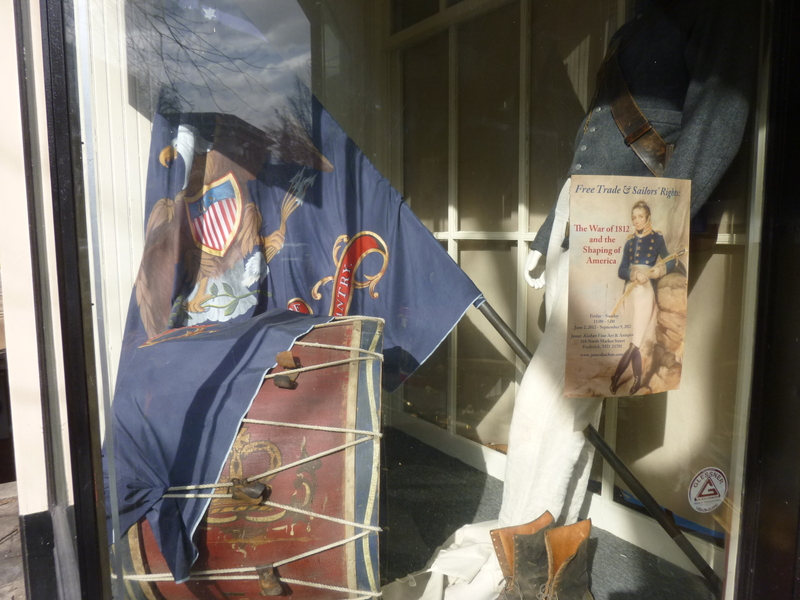 And Frederick turned out to be such an old, interesting, big historic town that the short walk I was going to take turned into 5 miles – there was something fun to see around every corner! 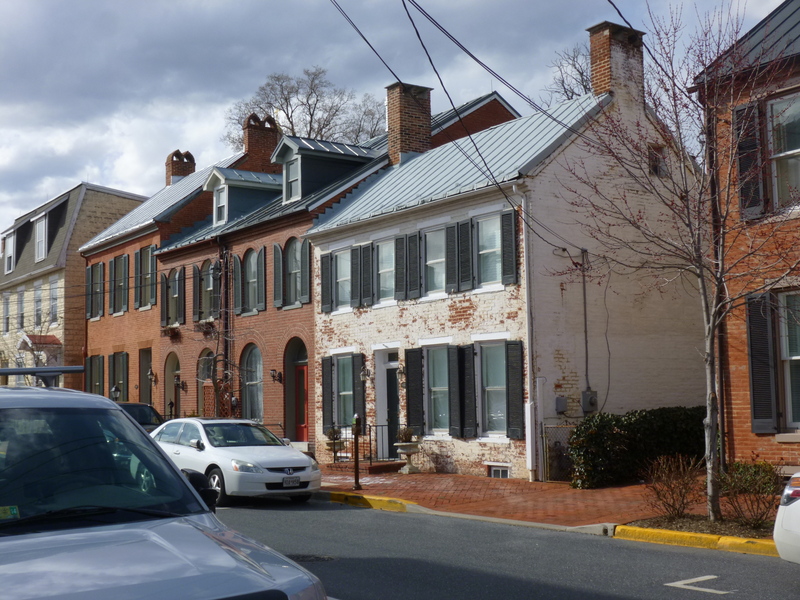 I loved the colonial feel of the town and the buildings that have seen generations of living. 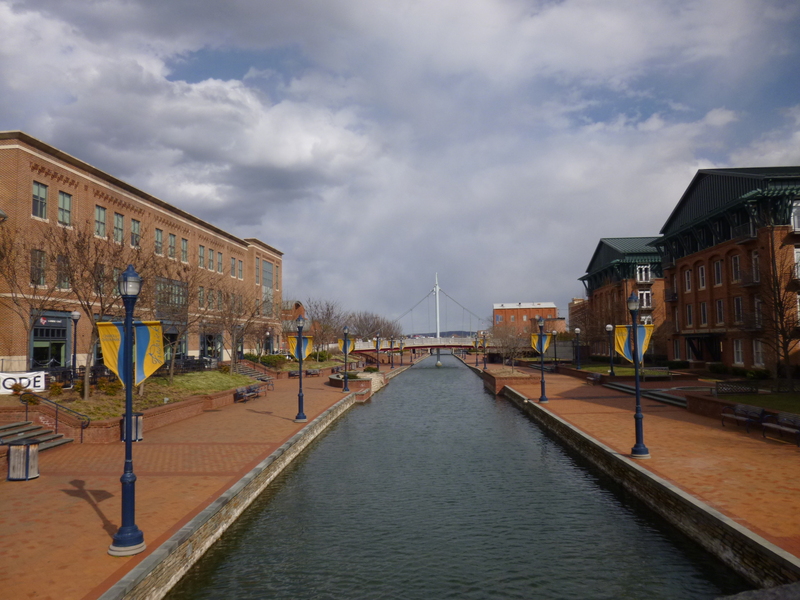 There was also a canal walk through the middle of town, and I always like those. 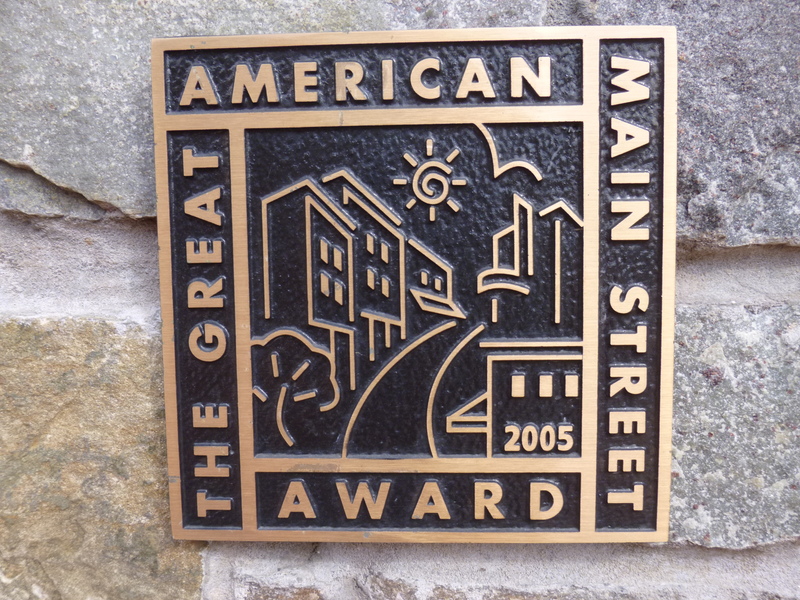 There was a plaque at one end of the canal that explained how the town was full of canneries, tanneries and mills as early as the 1700s, and the racket, stench and smoke was quite something back in the day. It’s all cleaned up now, and many of the buildings have other purposes. And a firetruck went through town – one of the really long ones that needs a second driver in a cab in the back to steer the rear wheels – I’ve only seen a few of those trucks. 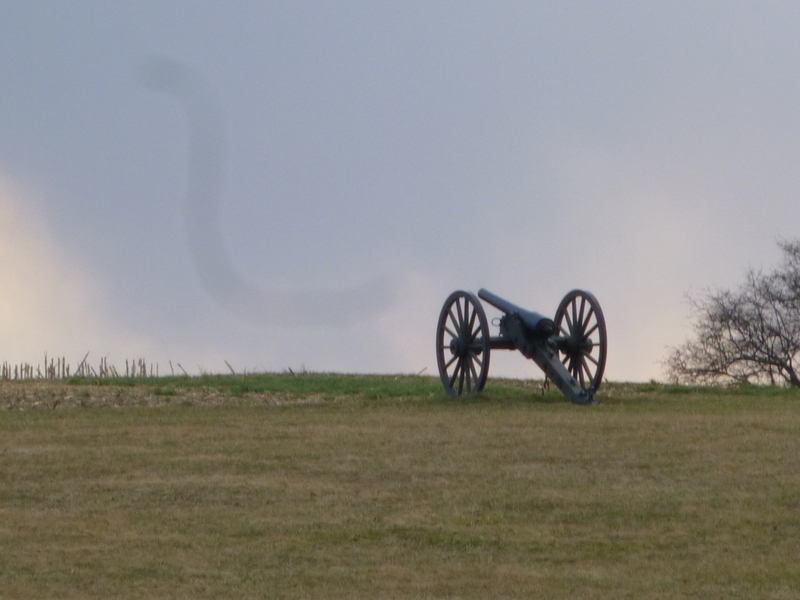 Even though the day was wearing on, I still wanted to head to Antietam for a little while at least. 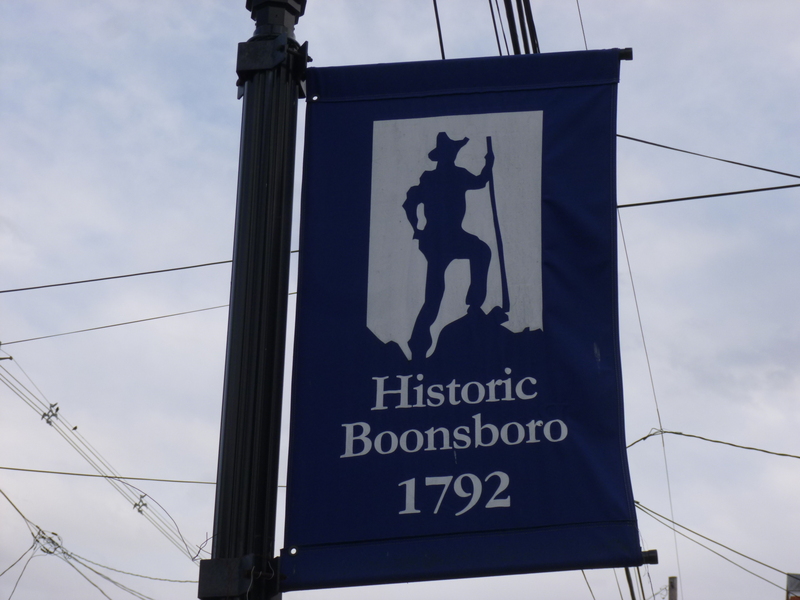 And I stopped in Boonsboro on the way – another old town that was settled by Daniel Boone’s cousins. 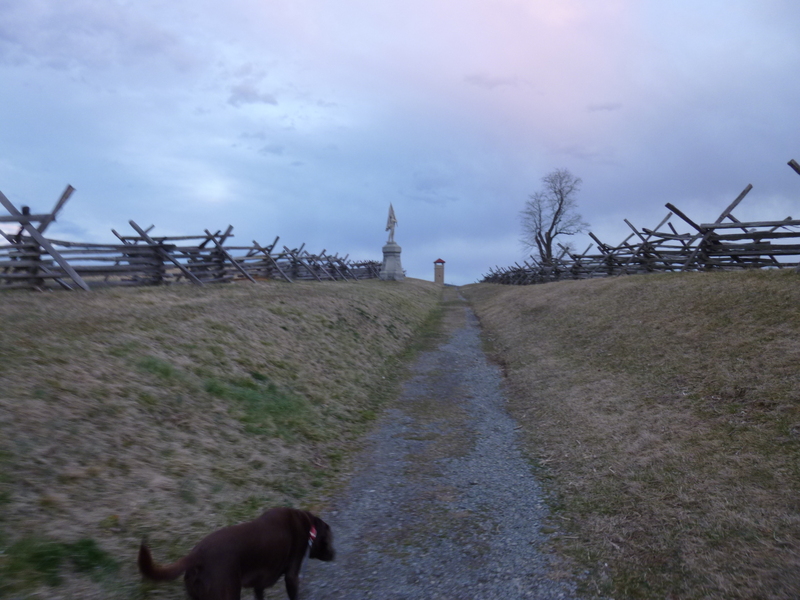 Then I made it to Antietam and drove and walked around some of the battlefields – a bloody battle it was. 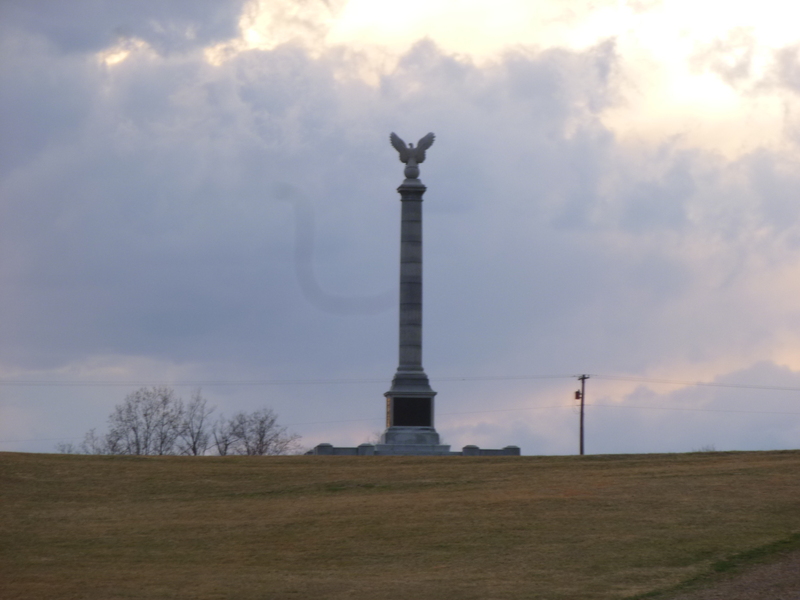 There were statues and memorials here and there, and descriptive plaques – all the hills made good cover for both sides. When the sun went down I had to call it a day, and I headed east toward State #26.